What is the Self? This question resonates from the earliest beginnings of self conscious human life. Everywhere that man has awoken to the true wonder and terror of existence this question has already been there waiting for him. This question is the same question as arises at the dawn of all human awareness and inquiry: Why is there anything rather than nothing? This question heralds the beginning of Philosophy and our entire entry into full self consciousness which embraces and inquires into all that exists. What is the Self? Only by being a Self can the question arise and naturally, and not too tautologically; only an authentic Self can answer it. For thousands of years rivers of ink have been spilled and often squandered on this question. The earliest writings we know of stretching back into the earliest Hieroglyphs of Ancient Egypt and the earliest Vedas of India; the Self is there contemplating and even answering the question of the Self. What is the Self? At some time while still a child we awaken to the inevitability and uniqueness of this very Self that only “I” myself am and can be; no other can be “I” and “I” no other. It is a moment of profound awakening and wonder, and with it the realization, that the Earth the world the entire Universe was here an infinitely long time before we arrived. At this moment of Self awakening in a human moment that feels like eternity; we discover ourselves, in all our strange and familiar uniqueness. There is longing in the awakening whether subtly or passionately felt; yes a longing for Self realization, the call of unique destiny is heard in the silence of the mind and felt in the innermost heart. Who is this Self? Each and every unique awakening Self is given over absolutely and often helplessly to this question. Who am “I” ? What am “I” ? Is there a purpose to my life ? For theosophy the Self is a complex blend or fusion of seven distinct and identifiable principles. Three of these principles are permanent, though not necessarily unchanging, and four of them are periodic, which is to say impermanent. The “I’ the Self can light up and apprehend the fact that it exists unto itself as a physical being with five senses, sight, hearing, touch,taste, smell, organs of experience, and an array of organic needs like hunger, thirst, the need for activity and rest. The need to expel waste. The “I” the Self lights up as a Psyche a personal Soul; a field of surging emotions and desires. The accumulated psychological content of the Psyche is highly responsive and also reactive. 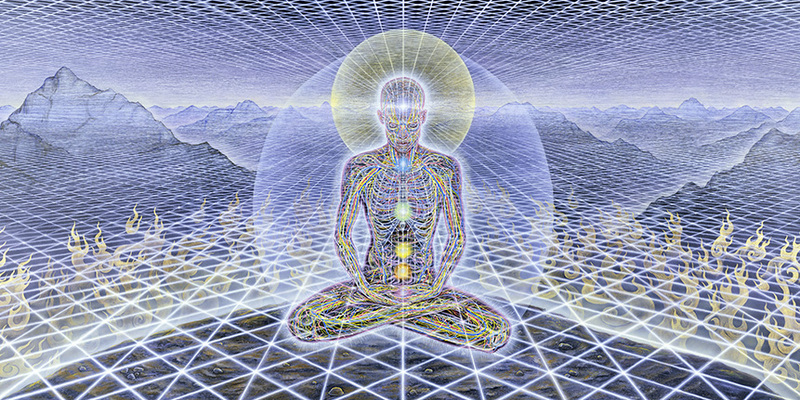 All purely personal and subjective needs and desires, of a repetitive nature are imprinted in the Psyche and respond and react in an automatic and highly conditioned way.Subjective desires that we can visualize and experience as private fantasies, which are capable of producing a reaction and response in the energy field  and physical  arise here in the Psyche . All of our personal emotions and sense of personal private psychic space. Are formed and sustained as personal likes and dislikes in this field we call the Psyche. In theosophical literature it is also called the “Astral Body” and is also the site for our often irrational dream life. It is also called “Kama Rupa” Kama = Desire; Rupa= Form. The content of the Psyche can alter its form and the way sensations and desires resonate within it. This is the site for what is called the Astral Light, that state of imaginative consciousness where all perceptions appear as animated images and beings. Every imagined truth is wrapped in the many coloured robes of wishful thinking and illusion. . The “I” the Self lights up into the world of consensus reality as a member of a family a community, of friends and coworkers, a member of ethnic inheritance, the recipient of a culture and language. When we are called upon to be conscious in the everyday world; to perform a function, and to give an account of ourselves and provide our ID it is the “I” as the Fourth Principle  that shows up. The fourth principle is called the personal Self within the perceptual horizon of the ‘lower mind’; which can internalize received information knowledge and training. As a known person in a world of others its existence and reality is confirmed to it by the agreement and contradictions it receives from others. Both objectively and subjectively it contains the three principles in which it is embodied and embedded. The “I” the Self in this state is the one to whom the Cartesian axiom “I think therefore I am” most appeals. There is truth in in the axiom for the fourth because it is the fourth principles capacity to think that most clearly distinguishes it from principles   . However the ability to actually think new thoughts does not originate in the fourth principle as such, but originates in the fifth  which is integrated into the “higher self”; the permanent or immortal part of the human being. In order to describe the experiences of the Self in the higher states of after death existence it is necessary to enter into the Self in its true and immortal states which in theosophy is called the Higher Self. It is important to form an understanding of the Higher Self in order to comprehend the after death experiences that extend beyond the Four states already described. What is the Self? Part Two: Will describe these higher principles and states of being.